Local biodiversity is rarely being noticed by the main part of the population. The knowledge of the biological variety and its protection has very little significance. To change this attitude and to make sure biological variety becomes an important subject, it seems appropriate to introduce the topic very early, such as during adolescence or even infancy. To achieve this, the project Finde Vielfalt - Experience Biodiversity with location-based games offers access to discover local biological variety and to learn to appreciate its value. 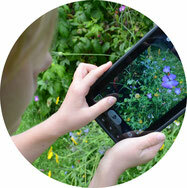 Biodiversity should become accessible through modern technology on mobile electronic devices (Smartphone, Tablet). In addition, its significance can be visualized. With the so-called Geogames (location-based games) contemporary conceptions of the Experiental Outdoor Learning and the inquiry-based learning can be transferred and connected in a motivating way. Different Geogames with different local reference are developed for various target groups to optimize the access to this topic. The Geogame The Green Treasure is a mobile trading card game for families with children aged 6 to 12. Plants with special characteristics should be found in this game. These grow in completely different places - they just have to be found. The players use the picture-function on their smartphone or tablet to capture their discoveries and to sort them into different treasure chests. The aim is to fill all treasure chests with suitable discoveries. The value of the discovered plant can’t be known from the start. The value depends on the perspective. The Foxglove might be a valuable medical plant, but is unsuitable as a food product. Even the dandelion can still surprise the player with unexpected values. You can find more information on the game The Green Treasure here and by watching the video. There is special information for parents, teachers and children. 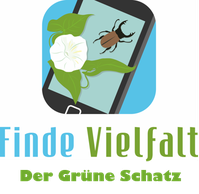 The Geogame Finde Vielfalt Simulation is a simulation game for school classes from grade 7. In this game, the dilemma between the economic interest and the nature conservation must be solved. The players get pulled into a story, which leads them to actually existing locations. Out in nature, tasks to discover biodiversity have to be solved. The player needs to make decisions during the simulation to achieve economic success and also to maintain biodiversity. The player can achieve different awards in the end, depending on the score. If you can prove that sustainable and profitable agriculture are compatible, you might be prized as a “great orchard grower with glamour factor”. You can find more information on the game Finde Vielfalt Simulation here and by watching the video. There is extra information for parents, teachers and children.